Chief Judge Randal G.B. Valenciano (left) and Judge Kathleen N.A. Watanabe (right) congratulate the six individuals graduating from the Kauai Drug Court Program. 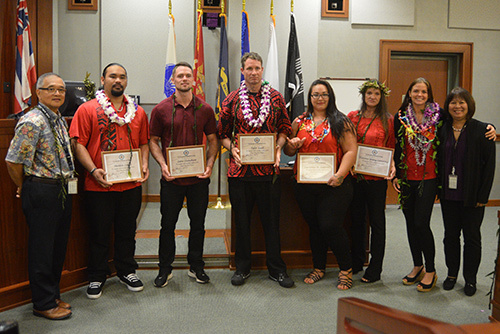 The Kauai Drug Court celebrated the dedication and accomplishments of six individuals who completed the intensive court-based treatment program on November 16, 2018. Since 2003, when the Kauai Drug Court was established under the direction of Judge Clifford Nakea (ret. ), 218 individuals have graduated the program and rejoined society. Drug Court is designed to address specific social problems related to substance abuse in order to minimize their societal costs, and protect the community by providing timely and effective treatment for justice-involved youth and adults. The program provides alternatives to incarceration, alleviates probation caseloads, and helps those struggling with substance abuse change the way they think and behave, while acquiring skills to successfully begin a new life. For more information on the Kauai Drug Court, please call (808) 482-2363.